"The partnership we’ve built with MMT Digital is an evolution of the traditional client-agency relationship. By forming a single, fully integrated team across our organisations, co-located in our offices, we’ve gone way beyond the boundaries of in-housing. 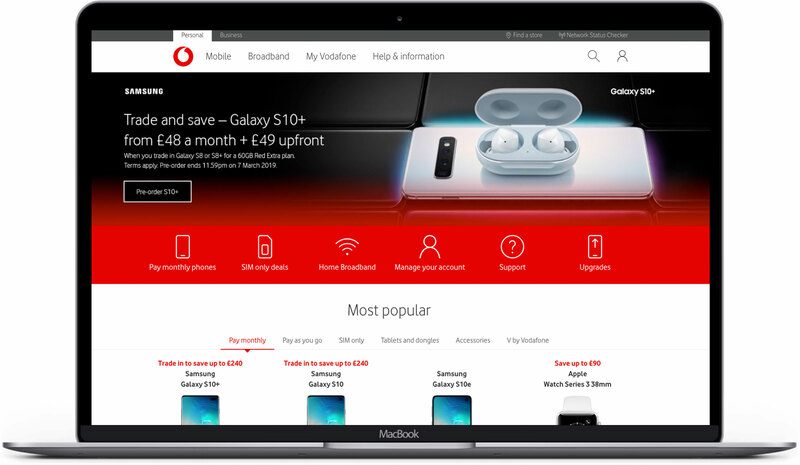 This new model has enabled us to deliver a number of key initiatives, from launching new products and services, building a new digital infrastructure, rolling out agile methodologies at scale to revolutionising the customer experience with emerging technologies, which have been transformational for the Vodafone business and our people." Vodafone had begun to scale out their agile delivery model, loosely following the Scaled Agile Framework (SAFe) as a guideline. However, there were some significant challenges around creating a truly collaborative culture, technical challenges with infrastructure and DevOps, a lack of an in-depth understanding of SAFe and a need to improve agile best practices at the team level before scaling. The goal was to be able to deliver value to customers more quickly and more regularly, improving quality (Engineering Excellence) and infrastructure cost savings through a modern cloud-based infrastructure and DevOps culture. The platform needed to be re-architected away from a monolithic platform which was inhibiting time-to-market and innovation and towards a modern, flexible microservices architecture. We worked with agile training and consultancy partner Radtac to help rollout SAFe best practices across the teams. We built a co-located agile delivery team in Vodafone’s office which combined their permanent development team and our 40 people so we could provide mentorship and training to enable their staff to own the development of their digital platforms and reduce the reliance on third-party partners. A one-team culture created the environment to transfer best practices and de-risk delivery through transparent communications. Scrum team best practices were enhanced through technical product owners, scrum masters and agile coaches. Our infrastructure experts were embedded to improve cloud hosting architecture and create a DevOps culture to enable rapid releases to a live environment. Innovation sprints and a culture that encourages experimentation within teams led to the development and release of the world's first end-to-end ecommerce chatbot, TOBi.